The ways contemporary global art investigates contemporary issues can often be totally pretentious, but sometimes also brilliantly accurate. 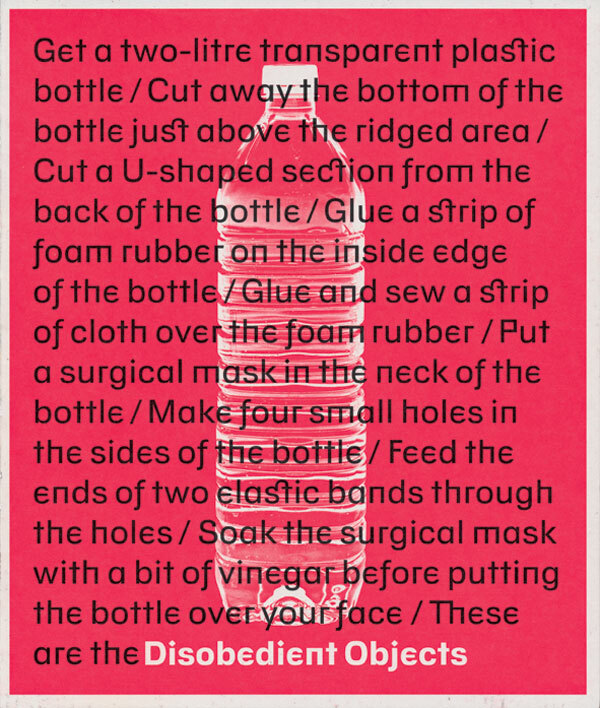 “Disobedient Objects” falls into the latter category, being an exhibition about objects that have been re-thought for political purposes. Curators Catherine Flood and Gavin Grindon have researched and contextualised what is “behind” these objects and discuss possible new, inventive uses for them. Already recognised and valued for their primary use, their reinvented functions and new meanings symbolise the unfolding of specific and effective strategies for social movement, especially in their manifestations in public space. This timely approach, defined as “design ingenuity and collective creativity”, is investigated over a period from the late 1970s to now, a kind of new definition of contemporaneity: an era when new technologies and media have completely redefined communication strategies in politics. With their new, ambiguous meanings, these “objects” constitute a loosely defined category. The accompanying catalogue is no less thoughtfully compiled and designed. It documents different implicit or explicit narratives triggered by appropriate “innovation” in different contexts (from barricades to DIY communication infrastructures, to differing attitudes between countries). It also includes ‘How-To Guides’, classic tutorials for building specific objects (reminiscent of similar schemes published in anarchist publications) that are freely downloadable from the exhibition website, resulting, in the end, in a very well documented and tightly conceived publication.